*I received product in exchange for this post. All thoughts and opinions are my own. Well hi there! If you are coming from Pretty Practical Home, welcome. I’m finally proud to show our downstairs bathroom/laundry room. It’s such a cute little space thanks to our awesome sponsors. I’m still waiting for one more shipment but today is the day for the reveal so without further ideu, here’s our room tour. After you come into the foyer you can see into the laundry room. Since we don’t have any outdoor storage and not much closet space, our board games, craft supplies, tools, medicine batteries, and lightbulbs are stored in this brown cabinet that we purchased at a Japanese furniture store. The bins on top store more craft and office supplies. The gorgeous print that you see is from Minted.com. It’s titled Daydream No. 1 and was painted by Julia Contacessi. Once you come into the laundry room, the room is no longer taken over by a kitty litter box and a wall of hoses and cords. Now you’re greeted with an interesting vignette of artwork, baskets, and plants. The large plant is a hidden litter box from Amazon. I painted the blue stripe for more interest and added coral for a filler. More art from Minted creates a beautiful display with the “cord covers” above the washer and dryer. This Blue Cactus Print is by artist Wilder California. The herringbone frame makes me swoon and is in a lovely juxtaposition to it’s neighbor. This Minted art is titled Moth No. 2 and was created by Nikkol Christiansen. The laundry supplies are corralled in a basket tray on top of the drier. I quick coat of blue ties in the laundry pods jar to the hidden kitty litter pot. To the other side is the sink and the door to the bath. A framed instagram picture from Framebridge creates a nice focal point in this bright space. I was really impressed by the quality, packaging, and shipping from all of the art pieces I received. They made it all the way to Japan quickly and in perfect condition! The image I chose is actually a shot I took in our neighborhood. Even though they are made of concrete I found the row of houses really interesting. Isn’t the frame fabulous? I have another piece coming in that beautiful burled wood for this space! The last new item in this space is a blue rag rug I ordered from Amazon. Now for the actual bathroom. The first shower curtain I ordered was in a black and white aztec pattern but the shipment never came. In fact I received a bag of clothes instead of the home decor items that I had ordered. You can imagine how disappointed I was. Amazon saved the day once again with a quick delivery of this fun Octopus curtain. We do live out in the middle of the ocean so I thought it was appropriate! I found these towels at a local store after the Turkish towels I had ordered in blue and tan arrived in purple and yellow. Not a good month for shipments y’all. The yellow wall storage unit that I’ve talked complained about before, is styled with my faux living art and bathroom supplies. I’ve shown you the tray on top of the commode before but here it is again with a new friend in the copper beer cup. A new canvas bin takes place of a traditional trash can. I really like all of the different textures that made it into the space. *These are affiliate links, click HERE to read my full disclosure. Thanks so much for stopping by. I can’t wait to see what everyone else is sharing this week. 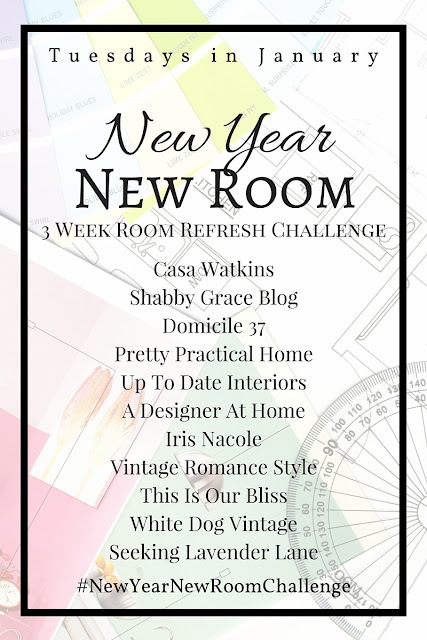 A Designer at Home is next on the blog hop! Very pretty Kathy! I love that living wall feature how different. The octopus curtain is adorable and the bamboo blanket ladder is perfection. Oh wow, sorry to hear about all your shipping woes. Nonetheless, your space looks beautiful and you did a great job improvising. Love it! I bet Amazon is your BFF!!! Love how you had fun and creative in this space. Love all the different textures and frames. The moth frame, OMG! I mean, they are all great but I’ve been eye ballin’ that frame for a while! Awesome job! Thanks Sara! Amazon and I have definitely become close since I moved. lol Those frames are to die for! 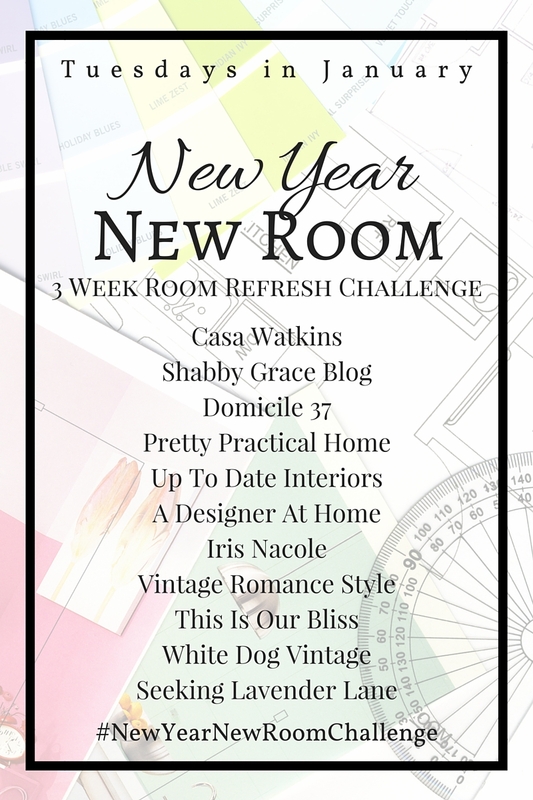 Your room is such a wonderful example of how just a few changes can yield a big difference. The art and basket collection makes the space so bright and fresh! I love the octopus shower curtain! Enjoy the new laundry and bath–they’re lovely! This turned out great Kathy! I love the living art in the yellow cabinet. It makes the whole thing look like a large art piece! The baskets on the wall are awesome and adore all the art from Minted!! There are so many clever things in this space that I just love. The basket covers are so great. The litter box/planter combo is also really smart! The accessories really make this special, but I think the succulents in the storage unit is my favorite touch. Great refresh! Thanks sweetie! I’m so in love with the new art!